Ayurvedic massage, also referred to as Abhyanga, is one component of the traditional Indian practice of Ayurvedic medicine, supports an integrated, all-encompassing approach to overall balance and well-being through lasting lifestyle changes. Ayurveda, “science of life,” began in ancient India, where medical experts began organizing and recording these traditions in writing more than 2,500 years ago. One of the world’s oldest healing traditions, Ayurveda remains the primary approach to medical treatment for people in some parts of the world. In the United States, Ayurvedic medicine is considered a complementary and alternative approach, and Ayurvedic techniques are most often used in conjunction with modern treatments. In recent decades, hundreds of thousands of Americans have incorporated Ayurvedic medicine into their health care. 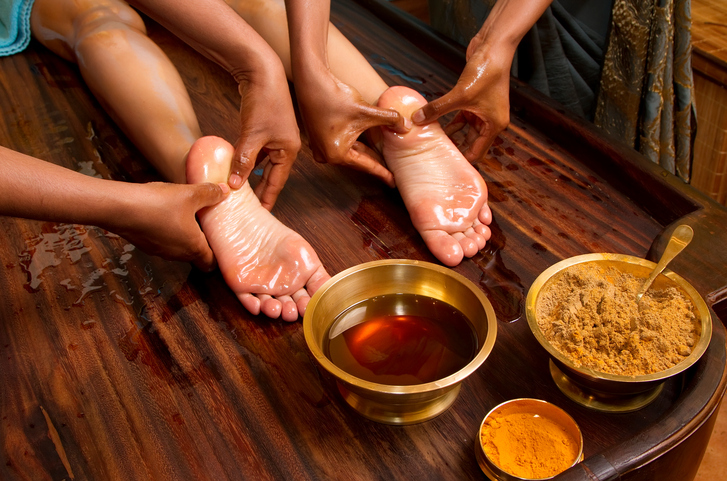 People often experience Ayurvedic massage therapy as part of the larger Ayurvedic lifestyle, and many massage therapists will offer the client advice on relaxation, exercise, nutrition, and sleep habits along with massage therapy. This approach is often used by people who are attempting to lose weight, but it has a range of other benefits. People have practiced Ayurvedic medicine for thousands of years, and many find this tradition to have significant benefit. Modern researchers have begun to examine these traditional practices to better understand their effectiveness. In one study, researchers observed the heart rate, blood pressure, and stress levels of 10 women and 10 men before and after they received an hour of Abhyanga (traditional Ayurvedic oil massage) therapy. After the treatment, the heart rates and stress levels of the participants had lowered significantly. However, only the participants who had prehypertension experienced a reduction in blood pressure. What this means is that Ayurvedic massage can bring bodies into balance if they’re out of balance but does not appear to lead to unnecessary changes, such as lowered blood pressure, in those who are already in good health. Kapha, the water/earth element, is linked to a large body shape, and obesity may be a concern for some. Pitta, the fire element, is often associated with a medium body shape. Some individuals may experience digestive issues. Vata, the air element, is linked to a thin body type. Those who are categorized as such may have trouble absorbing certain nutrients. Those who have an excess of energy in one area or element may find that this approach to massage can help them find greater balance and become better able to address any effects of this imbalance on typical function. Ayurvedic massage is usually offered as part of an overall system of health, well-being, and balance, and massage therapists help clients create an individualized program to bring the whole self into harmony. Many individuals seek Ayurvedic massage for its weight-loss benefits, but the practice emphasizes the necessity of long-term lifestyle changes for lasting results. Oils are used in Ayurvedic massage, and therapists will choose an oil they believe is suited to the client’s particular body type, imbalances, and health goals. Some practitioners blend and cook their own oils, using specific herbal mixtures for each client. The very small molecules that make up Ayurvedic oils easily penetrate the skin and deliver healing herbs directly into the body. Ayurvedic massages are generally full-body massages, where the therapist works on a client’s hands, feet, torso, neck, head, arms, and legs. Clients are advised to discuss any questions or concerns about the disrobing and draping process before the session and communicate their preferences, as well as any discomfort they experience, to the practitioner, in order to have the best possible experience. Because Ayurvedic massage oils may include sesame or coconut oils, clients should also discuss any allergies they may have with the practitioner before the session. In Ayurvedic massage, oils may also come in contact with a client’s hair. While the oils may be good for the hair, clients who prefer not to have oils in their hair will likely wish to inform the massage therapist of their preference before the session. Initial discussion with the massage therapist should include the needs, goals, and health history of the client, as practitioners with a good understanding of a person’s unique expectations and needs will be able to better tailor the treatment to that person. After the massage, relaxation and hydration are always advised. How Can Ayurvedic Massage Help? Proponents of Ayurvedic medicine support its ability to help individuals resist illness, improve nervous system function, strengthen immune response, increase longevity, and facilitate long-term weight loss. Other benefits may include healthier skin, better vision and eye health, improved circulation, and the stimulation of internal organs. Ayurvedic massage is believed to help the body release toxic chemicals called ama. The tradition holds that high levels of ama in the body lead to weight gain and other effects that may not be desired. Proponents of this approach to medicine suggest up to 50% of a person’s bodily toxins may be removed when an Ayurvedic lifestyle (dietary changes, massage, and so on) is followed. Those interested in Ayurvedic massage or the overall Ayurvedic lifestyle are advised, as they would be with any style of massage therapy or weight-loss program, to first consult a doctor to determine if the approach meets their unique needs. People with conditions like deep-vein thrombosis (blood clots) should avoid all types of massage, and pregnant women should discuss dietary and massage options with their physicians before seeking these treatments. Research has determined that Ayurveda may offer benefit to many, when the support of a licensed Ayurvedic practitioner is pursued in conjunction with treatment from a Western physician who understands how to mesh complementary treatments with standard care. Basler, A. (2011) Pilot study investigating the effects of Ayurvedic Abhyanga massage on subjective stress experience. Journal of Alternative and Complementary Medicine, 17(5):435-440. doi: 10.1089/acm.2010.0281.